We all somehow love south Indian food. But it is not always easy to make different types of South Indian recipes quickly at home including Idli, Dosa, Vada etc. Here, I am presenting Karnataka style instant Rava vada recipe which is made with Sooji or semolina. These vadas are crisp from outside whereas soft from inside. 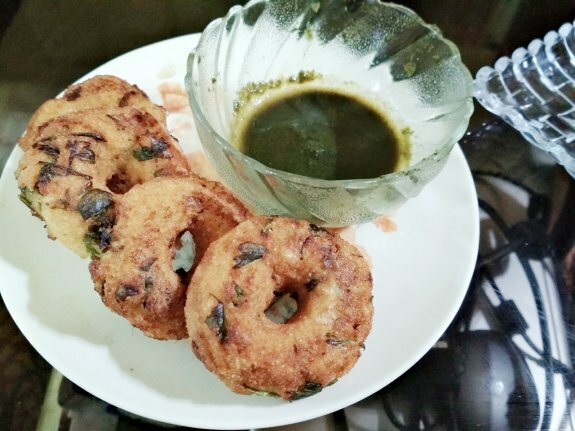 Rava Vada is not popular in every hotel or South India but you can find this recipe either in street food of South India or in some udupi restaurants. These are crispy fried snack that are easy to make without taking much time. You can serve this either with Sambar or creamy Mint chutney and can be a great companion for your evening snack time. 1. Take a big bowl and add Semolina and Curd. Now stir and blend the curd with Rava. 2. Add chopped ginger, green chilies and salt and mix everything very well. 3. The batter is little thick so you can add some water into it. Basically the consistency of this batter will same like the batter which is required for making urad dal vadas. 4. Now, cover the batter and keep it aside for 10-15 minutes to set. 5. After 15 minutes you will find that the semolina mixture is puffed up. Now, add chopped coriander leaves and baking soda and mix well. If you required more water then you can add 1 Tbsp water again in this batter and mix. 6. Heat oil in a deep fry pan. 8. Now divide the dough with equal portions and make balls with them. Grease water in your palm before dividing the dough and making balls from it. 9. Place the balls on the foil one by one and flatten them. Make a hole in the center of the flatten balls. 10. When the oil is hot enough, transfer the vada to your fingers and gently drop this in the oil. Do it very carefully so that the shape of the vadas will not destroy. 11. Fry on medium flame until the vada will turn golden. Place it in a kitchen tissue to drain the excess oil. 12. Do the same process for the rest of all the vadas. Serve this Rava vada or instant sooji vada with mint chutney.